Condition is Used and a Official Kindle fabric case. 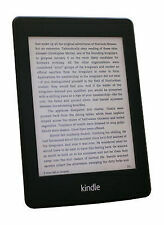 Amazon D01100 Kindle 4th Generation Wi-Fi 6 inch eBook Reader. IN GOOD WORKING ORDER. HAS SCRATCHES AND WEAR FROM USE. NO CHARGER. SEE PICS FOR HELP WITH CONDITION. 5 out of 5 stars - Amazon D01100 Kindle 4th Generation Wi-Fi 6 inch eBook Reader. 44 product ratings44 product ratings - Amazon D01100 Kindle 4th Generation Wi-Fi 6 inch eBook Reader. Amazon Kindle D01100 4th Generation. Great condition. This is a buy it now listing for the kindle only. Amazon Kindle D01100 4th Generation. See photos for condition. This is a buy it now listing for the kindle only. Amazon Kindle D01100 4th Generation. Black, in good working order. Please see photos. This is a buy it now listing for the kindle only. Amazon Kindle (4th Generation) 2GB, Wi-Fi, 6in - Graphite. Condition is Used. Scratch at the bottom next to the square button, see photos. Amazon charger cable and 3pin plug. Pink case has seen better days but I will leave it on for protection. SOLD WITH ORIGINAL KINDLE BOOK CASE. WILL INCLUDE USB CHARGING LEAD. VERY LITTLE USE AS BOUGHT TO USE WHILE TRAVELLING ON UNDERGROUND FOR A 6 MONTH PROJECT. Amazon Kindle (4th Generation) 2GB, Wi-Fi, 6in - Grey. Condition is used and there are some scratches (see photos). There is also a small mark on the screen which you can see. The black case is included. Dispatched with Royal Mail 2nd Class. Amazon Kindle Touch Model D01200 WiFi 6in - Silver. The silver is a bit worn on one of the corner which I have shown in the photo . Amazing kindle .this doesn’t come with a charger lead but they are easy enough to get Condition is Used. Dispatched with Royal Mail Signed For® 2nd Class. Amazon Kindle (4th Generation) 2GB, Wi-Fi, 6in - Graphite. Condition is Used. Dispatched with Royal Mail 2nd Class. Amazon Kindle 4th Gen. Used only a handful of times. Good condition. Comes with case, charger and instruction booklet. There is a small speck on the bottom left of the screen but it does not notice when reading a book. Otherwise the Kindle is in good condition and has always been used with a cover to protect it. 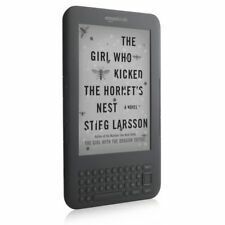 AMAZON KINDLE E READER - 4TH GENERATION 2GB WI FI - MODEL: D01100. Condition is Used. Dispatched with Royal Mail 2nd signed for.No charger takes Samsung charger. Amazon Kindle (4th Generation) 2GB, Wi-Fi, 6inch. Used but in very good condition. Some wear bottom left corner as shown in photo. Comes with original box and charging cable. Kindle E-reader. Screen clear and scratch-free. not included. Serial no. 95994-0725. FURTHER INFORMATION Thickness: 0.6" (1.5cm). Amazon Kindle (4th Generation) 2GB, Wi-Fi, 6in - Graphite. Used condition. Condition is good. Good used condition, it has 3 small marks on the screen that do not impact reading. I have shown this on the photos, the three marks are visible on the pics and when the book is being read it you cannot notice them but wanted the description to be spot on. Will come with a USB lead for charging. Dispatched with Royal Mail 2nd Class. Amazon D01100 Kindle 4th Generation 2GB Wi-Fi 6 inch eBook Reader - Graphite. Condition is Used. Dispatched with Royal Mail 2nd Class. Good condition. Kindle eBook reader, perfect condition. No charger of instructions included. Amazon Kindle 4th Generation. 2GB, Wi-Fi, 6in, Graphite. Working, comes with protective case. No screen dinks. No charger included but my regular android phone charger worked to charge it for this listing. Updated and de-registered ready for new owner. From a smoke and pet free home. Offers are welcome. Thank you for looking! This Kindle doesn't include its original box. As well as a great value Kindle, you will also receive FREE USB Charging Cable. [Information]. This was the last model of Kindle to feature a headphone socket for personal listening to a book or MP3 music files. Ready for you to connect to your Amazon account. -New Amazon Kindle (4th Generation) 2GB, Wi-Fi, 6in - Graphite. This Kindle has page turning buttons and is not a Touchscreen model. Ready for you to connect to your Amazon account. 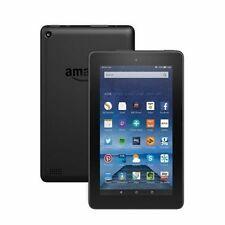 5 out of 5 stars - -New Amazon Kindle (4th Generation) 2GB, Wi-Fi, 6in - Graphite. 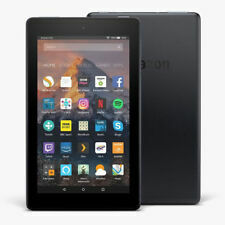 338 product ratings338 product ratings - -New Amazon Kindle (4th Generation) 2GB, Wi-Fi, 6in - Graphite. Amazon Kindle 4th Generation D01100 2GB Graphite Wi-Fi 6in. kindle is in excellent condition, and included a kindle leather cover which is a bit marked. Kindle and cover only, no cable or charger Dispatched with Royal Mail 2nd Class. This was the last model of Kindle to feature a headphone socket for personal listening to a book or MP3 music files. This is the more expensive 3G version enabling you free access to the WEB from virtually anywhere in the world. AMAZON KINDLE 4TH GENERATION (D01100) SOFT BLUE POUCH CHARGING CABLE 2 DISCS FOR FREE. 419 OF BOOKS ON KINDLE. HARDLY USED KINDLE IN EXCELLENT CONDITION & GOOD WORKING ORDER. AUTHORS OF THE BOOKS ON KINDLE. Model: D01100. Notes: main unit only. Although we have tested the item and appears to be working, we may not be able to check every single function. You will only get what is pictured. 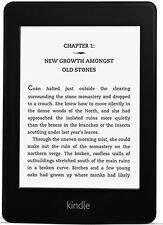 Amazon Kindle Complere With 400 Stored Books . Condition is Used. Dispatched with Royal Mail 2nd Class. Complete with cable and Amazon light up case. Left hand side buttons a little sticky, but right hand side (same functions) are in perfect working order. Fab condition Selling simply due to no need as I have recently upgraded....time to go to a loving new home. If you have any questions, please do not hesitate to ask. I am having a humongous clear out due to moving place, so a little look of my other items is highly encouraged!! Thank you for looking!!!! HAPPY EBAYING!!!!!!!!!! Amazon Kindle 4th Gen 2GB, Wi-Fi, 6in D01100. NO OTHER ACCESSORIES - JUST THE KINDLE AS IN THE PICTURES. Complete with genuine Amazon Kindle brown leather case with integrated reading light (light draws power from the Kindle battery). Used working Unlocked Kindle 4th Generation Model D01100 Motherboard. The kindle is in very good condition and has had very little usage. It has been well looked after. There are light red marks on the back from being in a case. Amazon Kindle (4th Generation) 2GB, Wi-Fi, 6in - With Leather Case. Condition is Used. (see photos).